The Wasp 3 Wheel Freedom. 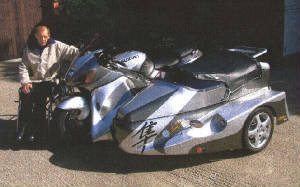 The 3 wheel Freedom is designed as independent transport for the disabled, primarily the paraplegic. It boasts a electrically operated ramp system allowing easy access and a transfer seat to assist the move from sidecar to bike. 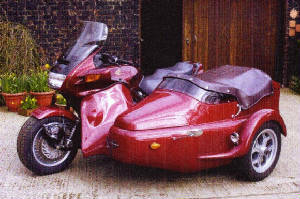 The sidecar can be fitted to virtually any motorcycle, although one with a traditional steel cradle frame is the simplest option helping to keep the cost down. It is also recommended that the motorcycle chosen is at least 500cc supplying sufficient power to cope with the extra weight. 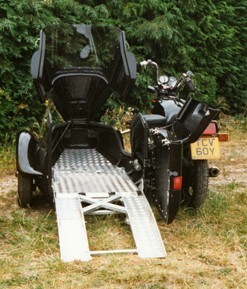 The 3 Wheel Freedom with its access ramps down. It is important to note that the standard wasp 3 Wheel Freedom is intended to be used by a disabled rider, if it is intended to carry a passenger in the wheelchair then a different windscreen and additional chair restraints are to ensure the safety of the passenger. P.O.A. The 3 wheel Freedom all ready to go. The 3 Wheel Freedom is constructed using a tubular skeletal space frame permanently bonded into a selfcolour fibreglass body shell, there is a extensive range of colours to choose from or it is possible to spray it with car/motorcycle paint for that perfect match. It is fitted with independent suspension, a 15" cast aluminium wheel and a twin piston brake caliper which can be linked to the brakes on the motorcycle. Barry Sykes with his Wasp 3 Wheel Freedom.